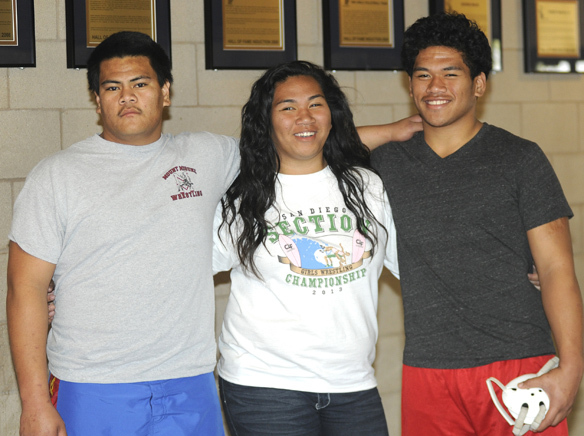 The family that wrestles together, well … wins CIF championships, at least where the Tausaga clan from Mt. Miguel High School is concerned. Last weekend, cousins Miracle and Josh Tausaga captured individual weight class championships at the San Diego Section Division IV finals at Mater Dei Catholic High School. Miracle, a junior, captured the 220-pound division while Josh, a senior, won the 285-pound heavyweight class. A week earlier, Miracle’s sister Leimai, a freshman, captured the 237-pound division at the second annual San Diego Section girls wrestling championships held at Steele Canyon High School. Leimai was one of three Mt. Miguel wrestlers to earn place-finishes in the 14-weight class tournament and one of 11 East County mat women to qualify for this weekend’s third annual girls state championship tournament in Lemoore. The top two place-winners in each weight class from the section finals qualified for the state tournament. Leimai pinned both her opponents at the Feb. 9 Steele Canyon event. She recorded a 17-second pin in the semifinals and pinned San Pasqual’s Melissa Gleason in 1:04 in the championship bout. Both Miracle and Josh recorded pins in all their matches at last weekend’s Division IV championship tournament to equally outclass the field. Miracle scored an 18-second pin in his first match, then followed with falls of 1:32 and 1:48 to advance to the title bout where he pinned Holtville’s Jose Sandoval in 2:45. Josh received a bye in the opening round then came out strong in his second match with a nine-second pin. He scored a 1:04 fall in the semifinals to advance to the championship match where he pinned Holtville’s Lance Angulo in 3:30. Miracle and Josh were among four Matador weight class champions at the Division IV finals, joining teammates Edward Marin (152 pounds) and Sonny Samoata (195 pounds). Both Marin and Samoata each collected three pins. Marin pinned Mater Dei Catholic’s Alonso Alzua in 3:46 in the championship match while Samoata pinned Mar Vista’s Johnny Hayes in 2:52 in the final. Mt. Miguel finished third in the team standings with 180.5 points, trailing team champion Valley Center (212 points) and runner-up Holtville (193.5 points). While Leimei will be seeking a medal at this weekend’s girls state tournament, both Miracle and Josh have set their sights on winning weight class titles at this weekend’s San Diego Masters state qualifying tournament at Eastlake High School. 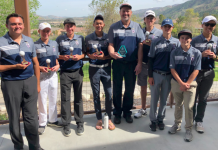 The top three place-winners in each of 14 weight classes from the Masters tournament advance to the boys state championship tournament March 1-2 in Bakersfield. 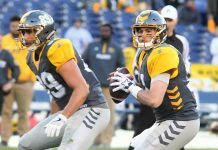 Miracle and Josh, who have only one loss each this season, are both favored to advance. “Hard work, dedication and coaching,” Josh answered when asked about the keys to their success. that isn’t the same unwanted rehashed material. Wonderful read!